In pool construction, the term "gunite" refers to dry mix and the term "shotcrete" refers to wet mix. In other contexts, "shotcrete" is the common term for both dry mix and wet mix. "Gunite" is a trademark name for dry mix shotcrete. 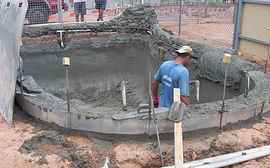 Gunite is one of the most expensive choices for an in-ground swimming pool, but it is also the most durable. It ranges from $20,710 for the pool only, to $35,900 for a higher end pool with extras.